How to Learn the NLP Meta Model. 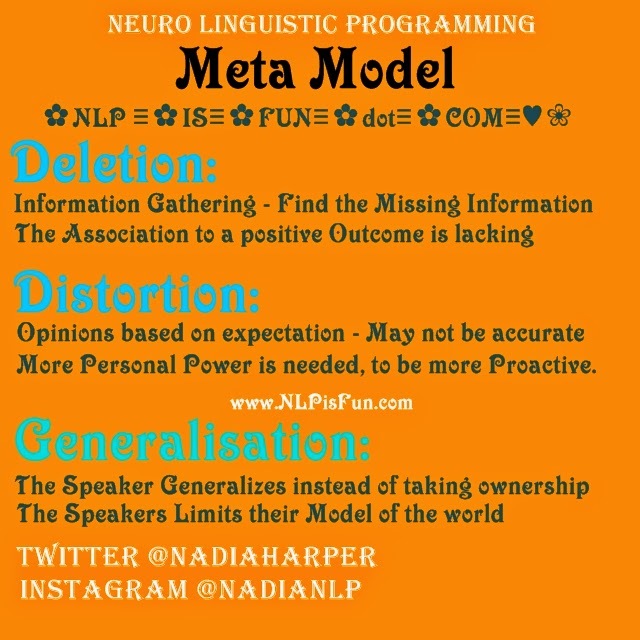 When it comes to the NLP Meta Model it is super easy to learn. But some people feel intimidated and don't invest the time into owning it, so that you can become great at Recognizing it. Think of the Meta Model in terms of Information Gathering. To Understand the persons Model, you must listen intently to hear how they reveal their Meta Model Violations. To recognize language as well formed these conditions must be met. In other words, because you say it as if it is true, does not necessarily make it true to me. I have the right to ask you a question about it, so that I can learn more about what you are communicating. The speaker has a chance to revise their previous expectation, now that they know there is somebody who has another point of view. 3. Contain no Nominalizations in which a Process is turned into an event and or is made Final, without going challenged as the the available options. 6. Contain no unexplored presuppositions in the portion of the model that implies the person has no choice. 7. Contain no sentences which violate the semantic conditions of well formedness. In order to become really good at using the Meta Model you must additionally become really good at how you connect with other people in terms of rapport. If you respect the person you are speaking to, instead of judging or criticizing, you can get to a place of curious questioning. The Meta Model works really well like this. If you are not doing this you will find yourself arguing perhaps and that doesn't feel good for anyone. Some people are super aggressive in using the Meta Model once they learn it, and become NLP Meta Monsters which are like NLP Mean Kids who are Language bully's. They thrive of saying crazy things like "Aha I caught you Generalizing ....."
Anyway I know you operate from a place of congruent Win Win and it is you I wrote this information for. We have the power to empower with this knowledge and I really love doing so, hopefully you do too. Next time I speak about the Meta Model I will split Deletions, Distortions and Generalizations into categories. I hope you enjoyed this Mini Lesson and I look forward to your feedback. If you like this Blog, share it with somebody who can benefit from this and all of the Archives.